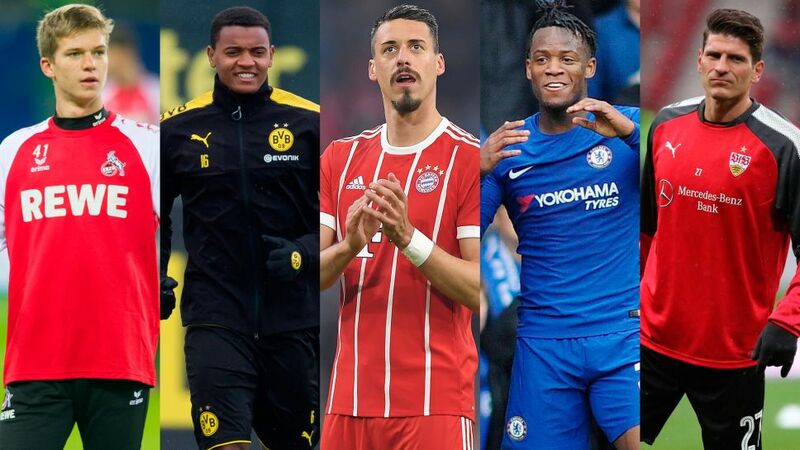 The closing of the January window – the final chance for clubs to chop and change personnel prior to the season's run-in – is always the perfect opportunity to assess how the Bundesliga's great and good have fared in the transfer market and are set for the remainder of the campaign. An athletic, all-action striker, Batshuayi boasts an excellent goalscoring record in one-and-a-half seasons at Chelsea. The Belgian averaged a goal every 88.5 minutes of the Premier League with the Blues, a record bettered only by Harry Kane (78.9) in players with more than 10 goals. Boasting a handy knack of scoring late goals (eight of his 19 Chelsea goals came after the 75th minute), Batshuayi also scored the goal that won Chelsea the title last season. It was clear throughout January that Pierre-Emerick Aubameyang would only be allowed to join Arsenal if BVB secured a suitable replacement: the brains trust at the Ruhr club believe that Batshuayi is that man. While filling the Gabonese's boots would be a tough ask for anyone, Batshuayi – intent on securing a place in his country's star-studded FIFA World Cup squad – is fit and hungry to prove himself. On top of that, as he said himself, there was a vacancy for a Batman at the Signal Iduna Park. What you see with Wagner is what you get. The outspoken frontman is as tough to play against on the pitch as he is withering to journalists off it, and as a result brings some additional bite to the Bayern frontline. Experienced and UEFA Champions League eligible, as well as a proven goalscorer, Wagner also has a desire to prove himself at the record champions having come through the club's academy only to leave in 2008 after four first-team appearances. Bayern have long sought suitable back-up for Robert Lewandowski. The Pole may be at his peak physically, but playing every single game at the level he does has become too much of a risk, as the Bavarians found out when he missed the first leg of last season's UEFA Champions League quarter-final against Real Madrid. Wagner now offers a goalscoring alternative to Lewandowski (as shown with his Matchday 20 strike against former employers Hoffenheim) in Jupp Heynckes' treble hunt. Happy to be back in his hometown and play second fiddle to Lewandowski, Wagner's choice of shirt number (two) was almost a surreptitious acknowledgment of his status at the Allianz Arena. Watch: Wagner - "I'm the best German striker"
Akanji has developed into every inch the modern centre-back at Basel: quick, good on the ball and strong in the air, the 22-year-old boasts Champions League experience this season and is fluent in German. Already a four-time Switzerland international and expected to go to the FIFA World Cup this summer, Akanji was the subject of interest from several of Europe's leading clubs on account of the aforementioned traits, but Dortmund acted fastest to add another of Europe's most promising youngsters to their stable. Since starting the season with five consecutive clean sheets, the BVB defence has struggled for cohesion, as shown most recently in Matchday 20's 2-2 draw with Freiburg. The departure of Marc Bartra and Ömer Toprak's failure to make the desired impact mean that a first-team spot alongside Sokratis is Akanji's for the taking. Koziello will add a dash of the unpredictable to a too-often-predictable Cologne midfield. The four-time France U21 international enjoyed an excellent 2016/17 as Nice finished third in Ligue 1 and qualified for the Champions League, but lost his way somewhat this season. Boasting a fine eye for a defence-splitting pass, Koziello is the latest in a long line of French talents to try their luck in the Bundesliga. Cologne are crying out for the diminutive midfielder's creativity and although on an upward curve, the Billy-Goats have only scored 15 goals this season, the worst return in the top flight. With Leonardo Bittencourt injury prone and Milos Jojic often instructed to play deeper, Koziello should complement Cologne's hard-working midfield nicely and is in line for a Bundesliga debut against Borussia Dortmund on Friday night. One of several January homecomings (see Wagner), Gomez brings goals, goals and more goals to Stuttgart. Well, that's the theory, anyway. The 32-year-old proved that he has lost none of his penalty-box nous when forcing an own-goal in VfB's only win in the last seven games, a 1-0 triumph against Hertha Berlin in his first game back at the club where he grew up. On top of the expected goals, Gomez also brings a whole career of top-level experience, as well as knowing and identifying with the club, having helped the Swabians win the title in 2006/07. Stuttgart need him because, well, Stuttgart need goals. Having found the net 16 times this season, only one more than Cologne's desperate return of 15, Tayfun Korkut's troops are crying out for some proven firepower. On top of that, Stuttgart's is deliberately a youthful dressing room and so Gomez's experience at both ends of the table – having fired VfB and Bayern to Bundesliga titles and helped save Wolfsburg from the drop last season – could prove invaluable.